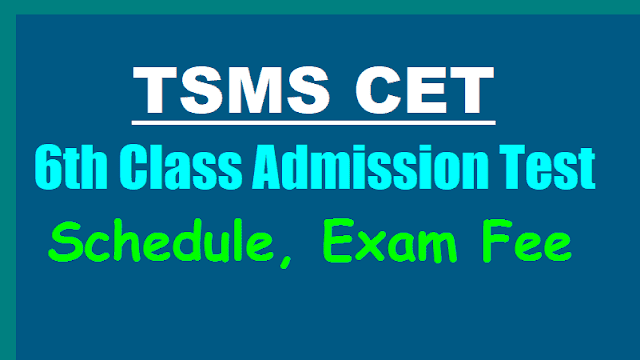 TSMS 6th Class Admission Test 2019 Schedule, Exam Fee, TSMS CET 2019: Government of Telangana, School Education Department, Office of the Director of School Education and Ex-Officio Project Director, has issued the 6th Class Model Schools Admission Test 2019-2020 notification (i.e press note) on January 20th, 2019 for admission into VI Class in Telangana Model Schools for the academic year 2019-2020. Mathematics, General Science and Social Studies are in bilingual (Telugu & English). Fee has to be paid at TS online centers. After payment of fee, applications have to be submitted by the candidates online in the web site http://telanganams.cgg.gov.in as per the schedule given above. All the MEOs would display the Telangana Model Schools VI class Admission test 2019- 2020 press note at your MRC for vide publicity and they would give vide publicity to Primary & Upper Primary schools in concerned Mandals. This has got the approval of Director of School Education and Ex-Officio Project Director, Model Schools, Telangana, Hyderabad. tsms 6th clas entrance schedule time table, tsms 6th/vi class entrance test 2019,telangana model schools 6th class admission test 2019, tsmscet 2019,tsms online application form, examination fee,how to apply,tsms 6th class admission test 2019, telanganams.cgg.gov.in.